As a wonderful Mac DVD to iPod converter, 4Media DVD to iPod Converter for Mac can convert home DVD to iPod movie MP4 for you to enjoy favorite DVD movie on your video iPod. Extracting DVD music solely as iPod MP3, M4A is also available. To enable you to enjoy wonderful Home DVD movies on your iPod, 4Media Software Studio provides the excellent Home DVD to iPod for Mac software. This Home DVD to iPod converter for Mac can fast convert Home DVD to iPod video MP4 and audio MP3, M4A for video iPod, iPod classic, iPod touch, iPod nano and iPhone. The Home DVD to iPod for Mac software presets multiple MP4 videos at different resolutions for iPod, iPod touch to most ease the Home DVD to iPod conversion. To get better playing effect, you can choose subtitle, audio track and aspect for target iPod movie. Choosing movie segment and splitting large file are available in this Mac Home DVD to iPod converter software. Most enlarge your iPod movie library using 4Media Home DVD to iPod Converter for Mac now. Convert any DVD to iPod video MP4 with different resolutions, and convert DVD to iPod audio MP3, M4A. 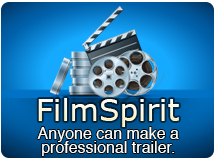 Convert DVD movie and music for freely playing on iPod touch, iPod classic, iPod nano, iPod shuffle and iPhone. Provide >200% conversion speed beyond your imagination and the speed increases with the performance of your system without limitation. Select the subtitle and audio track you want from original source for your target iPod video in 4Media DVD to iPod Converter for Mac. Just want to put the excellent parts on your iPod? You can clip the DVD movie to pick up the segments you want and merge them into a new one optionally for converting using this Mac DVD to iPod converter. By setting split size or time, you can divide a large movie into several parts when you convert DVD to iPod on Mac. With this DVD to iPod for Mac software, you can change other video and audio parameters like frame rate, aspect, zoom, angle, etc. to get better effect. Preview DVD with the built-in player and take snapshots of your favorite movie screens. This DVD to iPod converter provides you with a "one stop" way to convert and transfer DVD movies to iPod. 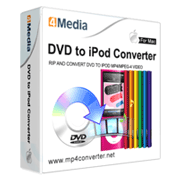 4Media DVD to iPod Converter for Mac creates a log file to record your detailed DVD to iPod conversion info for your checking anytim; and provides English, Japanese, French, Spanish, German and Chinese interface languages for you to choose. iPod touch MPEG-4 profiles are recently added. How to convert a DVD to iPod MP4 format on Mac computer?